Imagine putting yourself at the top of your to-do list this fall. Women who attend Homecoming can and do – even if the idea scares them, feels “selfish” or is a radical departure from how they typically choose to spend a weekend. Something – a force, an inner knowing, serendipity – has them put their stake in the ground (early registration opened April 1st), they claim their spot, and then they look forward to it all summer long. It’s their time. And they take it. That’s the thing about Homecoming – it invites you to break your own rules – to surprise yourself, to honor your instincts, to listen. And then act accordingly. 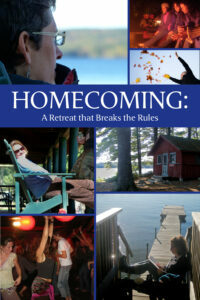 At its most basic level, Homecoming is a three-day women’s retreat in the fall that occurs on a beautiful lake in Southern Maine. It’s designed with the busy woman in mind, offering enough structure and choices to give you plenty of food for thought, but also lots of space and a boatload of permission to just blow it all off and fill your own days – or not. The retreat has happened every two years since 2008, and women have come to rely on it for their place to plug in, get grounded, find their mojo, and connect with some like-minded, amazing women. Homecoming is about allowing your own cup to be filled as a woman – sometimes for the first time. Ever. And it’s about acknowledging and celebrating what a radical and terrifying act that can be. It’s about recognizing and remembering just how powerful – and how deep – the well of your own resourcefulness goes. It’s about getting so quiet that you can hear your own inner voice talk – sometimes in a whisper, sometimes in a scream. It’s about making so much noise that you reconnect with your own voice and the sound of your laughter. It’s about meeting strangers that instantly “get you” and become fierce champions and enduring witnesses to your life way beyond the scope of Homecoming. It’s about moving your body, stretching your mind, getting your groove on, shaking a tail feather….and it’s also about sleeping soundly, breathing deeply, letting your mind roam freely, and having uninterrupted sumptuous meals that someone else prepares for you. And everything in between. Because you get to choose each moment of Homecoming. And the magic that happens – amid all these women listening and honoring, laughing and lounging – is that everyone feels right at home. No judging. No comparing. No shoulds. No self-consciousness. Just a whole lot of women truly doing what they want to do with in each moment – and feeling really good about it in the process. It’s a thing of beauty. So take your time – look through all the details, descriptions and schedule for the 2012 retreat coming up this October. Check out the photos and videos from the past retreats to get a sense of the place and the people. Feel free to reach out to me to talk more about the retreat. I realize making this commitment to yourself can represent a huge leap of faith for women, and I am committed to ensuring you have all the information you need to feel confident in your decision to attend Homecoming. Mark your calendar. Rally your friends or simply set a date with yourself. It’s your time. Take it. Early registration is open!